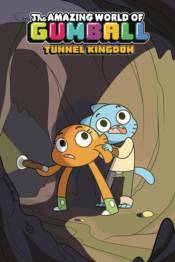 Gumball has his sights on one thing: getting the new action figure of action superstar Knife Fightgood�except when the package gets delivered, he sleeps through it. When Gumball and Darwin confirm the delivery has been made, they know the worst has happened: someone's stolen Gumball's toy! Along with Anais, the boys set off through town following the clues to a mysterious underground system Beneath Elmore and uncover a truth they never thought possible. From writer Megan Brennan (Steven Universe, Pencil Pup) and artist Kate Sherron (Regular Show) comes Elmore's greatest detective caper yet!